World Prematurity Day has always been really important to me. I know there are seemingly days for everything but World Prematurity Day is one that really resonates with me. Not only is it a day to celebrate, its also a day where organisations from all over the world get together to talk about prematurity, about solutions, about treatments and about our precious babies. This year like last year, I will be doing my 24 hour social media marathon, tweeting, sharing, chatting, blogging and getting the word out there about what's happening in the world of premature babies and the work Bliss are doing here in the UK, and supporting the partners around the world, all of us working together. I've also decided to dye my hair purple. Purple is the offical colour for World Prematurity Day, I've always wanted to try something outlandish! I will have hospital visits all week from November 17th spreading the world about Bliss so it is quite a daring thing to do. If you would like to join me in dyeing your hair purple, or painting your nails, or maybe having hair wraps or wearing a wig that would be great. Like me you can set up a fundraising page and get people to sponsor you. Make sure you get lots of photos to share on the day! Please stay tuned for more official Bliss activities, nationally and also around Manchester. Well done!! 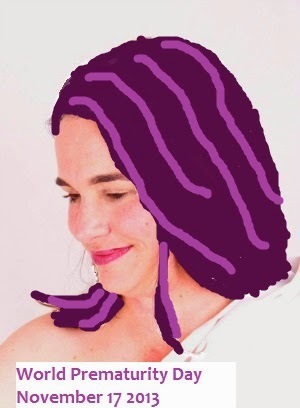 Purple hair is great (as is Read, but I get it's not the right colour). And loads of respect for your fund raising efforts!! DD is at 20 wks and all well so far..but am far more aware of birth issues now, as my own daughter progresses with growing her little girl. So grateful that all the interventions are there...should she or any other mum need them. Respect.